Thomas (1861-1924) was born in England and was for years principal of Wycliffe College, Oxford. Though he was a regular Keswick speaker, he also became co-founder, with L.S. Chafer, of Dallas Theological Seminary in 1924 but died in the same year (L.S. Chafer continued to serve as president until his death in 1952). Thomas was an early dispensational premillennialist to which in this book he makes frequent reference. This book, published posthumously in 1926 by Moody Press, is a classic, yet small, overview of the whole process of how God gave us the Bible. 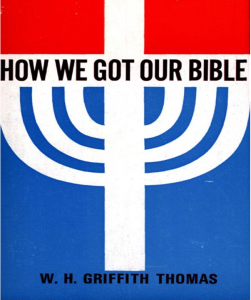 After recognizing the great contribution of the major texts in the history of translation (especially A, B, א ), Thomas says, “There is no reasonable doubt that we possess today what has always been regarded as the Scriptures of the Christian Church.” Of the collection of the 66 books that make up the canon of our Scripture he writes, “The Bible is not an authorized collection of books, but a collection of authorized books.” A great little book.